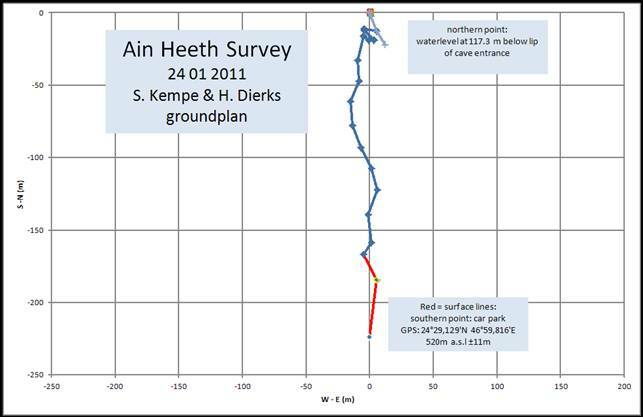 When Heiko Dirks and I visited Ain Heeth (Ain Hit, Ain Hith, Ain Heet) February 19th, 2008, we were able to descend into the lowest room that had been explored by divers in 2002. At the time the water was crystal clear and bluish (Fig. 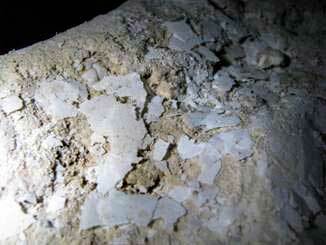 1), thin calcite rafts were swimming on the surface (Fig. 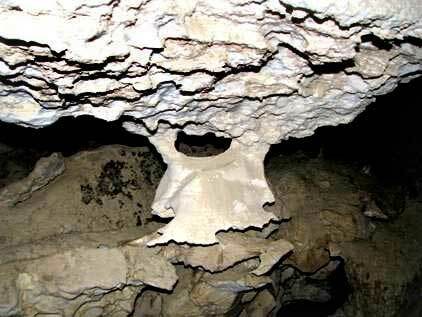 2) and we could study the dissolution features of the cave, typical for dissolution of convecting water, i.e. sections of flat solution ceilings with the typical solution cups (Fig. 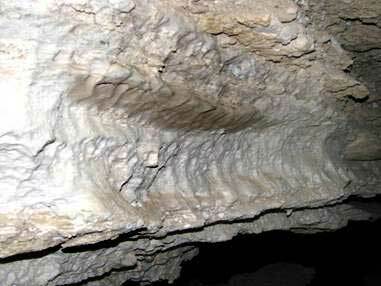 3), smooth, sloping side-walls, so called “Facets” (Fig. 4) and ragged protrusions (Fig. 5). We even took a water sample (Fig. 6) that was accidentally half drunk (in spite of clear labeling!) at a party the following night. Luckily we had not poisoned the sample, as we might have done if it had been destined for organic geochemistry. 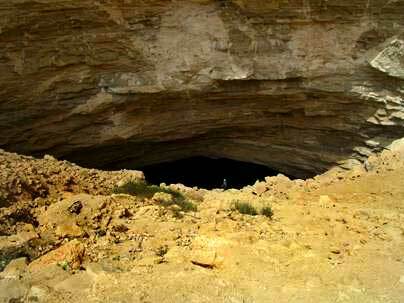 According to the survey Gregg Gregory and others made in December 2002 we must have been at a depth 146 m below the lip of the entrance, at that time the deepest point reachable in a cave in Saudi Arabia. The northward passage, explored by the divers was not yet accessible at that time. Fig. 4. Sloping sidewalls, typical of density-driven convective dissolution. Fig. 5. 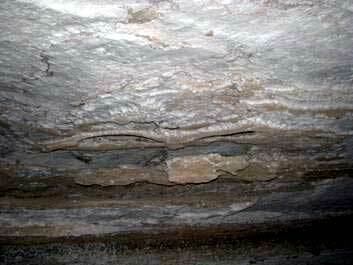 Ragged protrusions (pendants) typical of hypogenic convective dissolution. 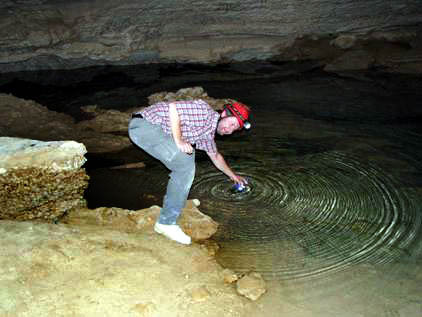 We had heard from colleagues of Heiko, who had made the trip down the cave a few month earlier, that they did not see our water level mark left in 2008 (Fig. 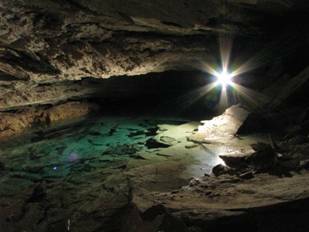 7) and they said that they did not enter a relatively low hall at the end, but that the floor sank steeply below the water level. 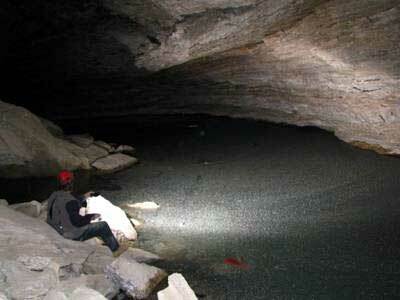 Thus we were eager to return, to check on the water level condition and take another water sample. Opportunity arose on the afternoon of January 24th, 2011, after I had given a talk about lava caves and the hydrological potential of the Harrats at the Ministry of Water and Energy (MOWE) at Riyadh. We took some time out to use a new dirt road to drive around above the escarpment and after following a few blind leads, finally found the dirt road that leads to the North-oriented embayment that harbors the entrance to the cave. This time the dirt track runs through the gravel pit in front of the embayment and is only passable with a 4WD, such as Heiko’s Toyota. We parked about 60 m away from the lip of the entrance, to be clear of any stones that might fall from the crumbling walls of lower Cretaceous, platy rocks that surround the embayment. Fig. 7. Water level mark left by us in February, 2008 at the bottom of Ain Heeth. At about 4 PM we had helmet, camera and backpack ready and approached the gaping entrance. From the lip of the descent one formerly had a magnificent view down the sloping passage (Fig.8), but now the view is obstructed by a massive pile of fallen Cretaceous debris (Fig. 9). This collapse of the western wall above the cave must have happened rather recently because the stones looked very fresh and had not been treaded on. Possibly the rain of a few days ago had dislodged them. 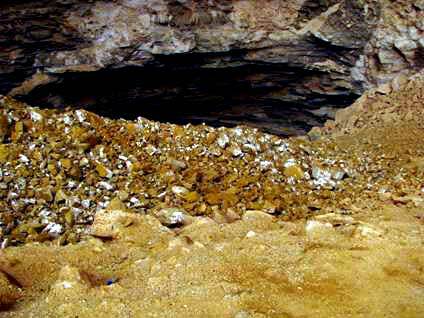 While we scrambled in (wisely keeping to the eastern side of the cave mouth), more stones fell and tumbled down the slope, just as happened to us on the way out, when stones kept on coming down. 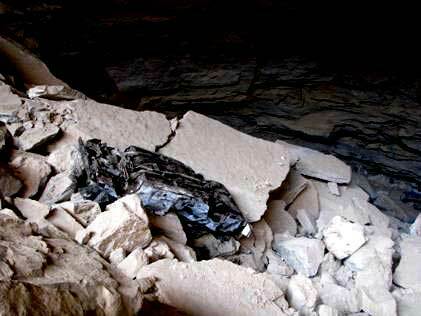 We moved, accordingly, quite quickly downward, sometimes sliding together with rocks, to get away from the vertical wall above us, when we realized that also the Heeth Anhydrite, the famous Upper Jurassic aquiclude of Saudi Arabia, had produced rock falls. These rocks are more like boulders, the smaller a few 100 kg and the larger ones of truck size. Where formerly a car wreck (however it got down here we don’t know) (Fig. 10) rested, now big, newly fallen blocks covered it. If this was one event or if these monstrous spars came down one by one cannot be said, but their fall had generated ubiquitous dust, that covered everything, including the garbage that reappeared in the deeper parts of the descent that were not affected by collapse. As quickly as possible we descended and came to the rocks where a rope hangs and that lead to a small passage between blocks behind which is a larger room. In this part the edges of the anhydrite blocks are quite polished from people traveling. 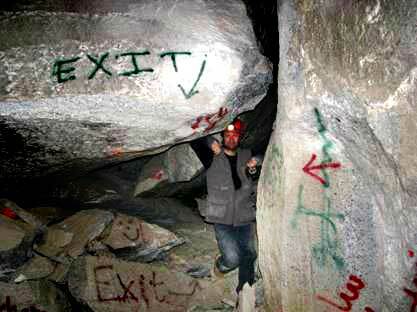 Many inscriptions “crafted” in industrial paint occur here. Another climb and turn down brought us to a very steep decline made of anhydrite slabs and below us, our helmet lights illuminated a darker plane, the current water level. Fig. 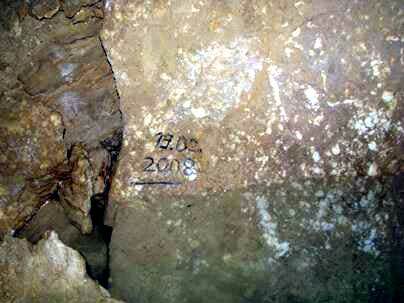 8: Opening of the cave in February 2008 (S. Kempe standing in center; Photo by Dirks). Fig. 9 Ain Heeth entrance partly filled with a new rock avalanche. Fig. 10 Formerly visible car wreck on the left side of the descending Ain Heeth tunnel. A light malodorous smell surrounded us and when we stood at the water’s edge (Fig. 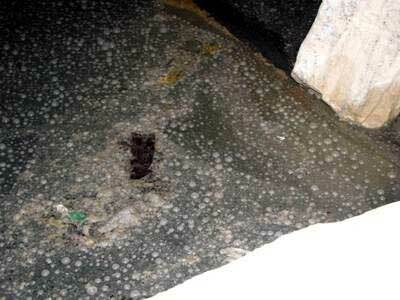 12), we noticed that the lake was not only dotted with floating garbage but also was covered with a grey bacterial slime, producing bubbles (Fig. 13). We were somewhat relieved to have Petzl LED lamps and no carbide as in the old days, because the gas could easily be methane. Heiko took – careful to avoid wetting his fingers – a water sample and we made sure not to step or fall into this slimy broth. After taking some pictures of the room we decided to survey back up to find out exactly where the water table was now, because for sure it was now higher (surprisingly) than in 2008 (Fig. 14 and 15). Seventeen stations and 117.3 m higher we reached the exit at about 7 PM in the dark. A pair of beady eyes had been watching our slow ascent from the newly fallen rubble and the voice of the muezzin from Kharj reverberated in the embayment as if in a large parabolic reflector. Fig. 12. The water table on February 24th 2011 at Ain Heeth. Fig. 13. Bacterial slime and bubbles of gas (methane?). Fig. 15. 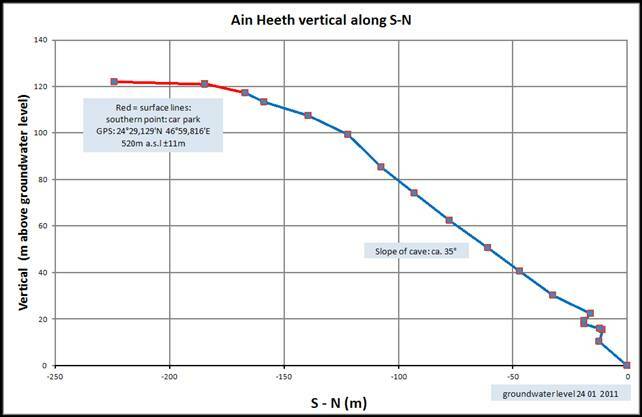 Vertical section along South (left) – North (right) projection.